(A) An increase in the price of crude oil, an important natural resource. Understand that crude oil is oil and therefore is a resource cost of business. 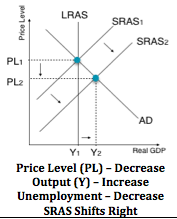 Stagflation for the AP exam is usually caused by rising oil prices that shift the SRAS curve leftward. 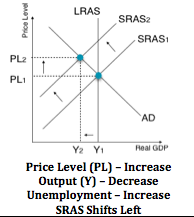 Raising costs (PL) and lowering RGDP. (B) A technological change that increases the productivity of labor. Productivity of labor implies that citizens of a country can produce more goods with the same resources due to technological change. This (in the short-run) is the graph that shows Growth. (C) An increase in spending by consumers. An increase in spending by consumers will increase the PL and increase the RGDP. (D) The depreciation of the country's currency in the FOREX. If a country's currency depreciates, the value of the currency falls, this will stimulate exports. Exports will increase as the currency value falls. As the currency's value decreases foreigners can buy more of our goods. 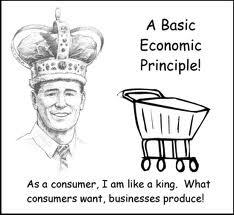 In essence our goods become relatively less expensive compared to foreign goods. If Exports increase then AD increases, PL and RGDP increases.